There is not much worse than being in an unfamiliar dark area with no idea where to find a light, or that feeling you get when you have dropped something vital into a dark crevice, but you aren’t sure if there is a “critter” down there that might bite or sting. 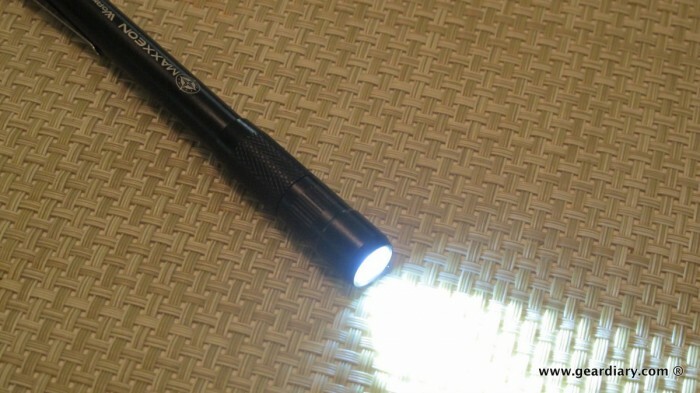 Carrying a pocket flashlight (or penlight, as we’ve always called them) is an easy solution, and I’ve found one that you might like to consider. The Maxxeon WorkStar 220 LED Pocket Floodlight is a slim penlight that uses three AAAA batteries, the first set of which is included in the package. The next set might be a little difficult to find at your local grocery store, but you can find them at Amazon and other online sources pretty easily. Maxxeon Inc., a manufacturer of cordless work lights and inspection lights for technicians. We design high performance lighting tools for professionals and do-it-yourselfers using state-of-the-art LEDs … This lighting tool produces a brilliant (120 lumens), wide beam of even, white light just as a quality work light would provide. The tool has been designed to use as a work light, that is, at a distance of 6 inches to 4 feet from the work area. The WorkStar 220 is about 6″ long and .5″ wide, and its body is composed of smooth aluminum with ends that have been cross-hatched. It’s turned on and off by pressing the cross-hatched rubber button on the end opposite of the LED. The LED end unscrews to reveal the battery compartment; the light is water-resistant but not water-proof, so there are no rubber O-rings. What I like about this penlight more than anything else is how bright the beam is. According to Maxxeon, this light is up to 20 times brighter than others, and I believe it. It blows away the other pocket flashlights I own — from the single LED keychains to the slightly fatter three LED “throw in the kitchen drawer” models.